If you wish to upgrade to the latest version of SliQ Invoicing Plus your data from previous versions of SliQ Invoicing will be fully compatible with the new version. If you are upgrading from SliQ Invoicing Plus V2 to SliQ Invoicing Plus V3 your data and template files will be transferred across automatically. a. If the SliQ Startup dialog appears, press the Restore from a Backup button (highlighted in red in the picture below). 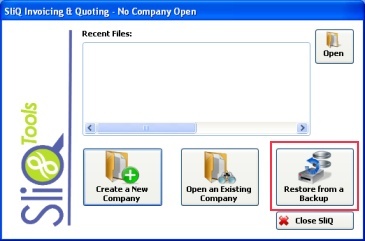 b. Alternatively, if you have already created a company in SliQ Invoicing V2 or V3 and the startup dialog does not appear, press the SliQ start button (highlighted in red below) and choose Company/ Restore Company. 3. When the Open File dialog appears, browse to the backup you saved from version 1 and press Open to import the data into a new company file.